Stunningly bright weather and relatively calm conditions enabled ten of us to see some unusual sea duck, divers and grebes today in and around the Roseland. 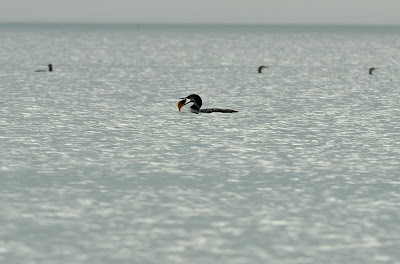 Approximately eight Black-throated Diver, one Great Northern Diver, three Common Scoter, three distant Slavonian and a single Black-necked Grebe were found in Gerrans Bay. We then moved to Cormerrans Farm overlooking the Carrick Roads. Calm conditions allowed us to find a pair of Velvet Scoter, c.18 Red-breasted Merganser, Great Northern Diver and five Black-necked Grebe, the latter being the start of the build-up of the normal wintering flock here. The image above was taken last year from Rosevine, Gerrans Bay and shows three envious Black-throated Divers watching a Great Northern Diver eat a flat fish. I wish I checked the cbwps web site. A good day and a lovely image from the archives Steve.